India's quest for finding the best among the three openers continued to offer no easy answers, with each of the three candidates being successful. 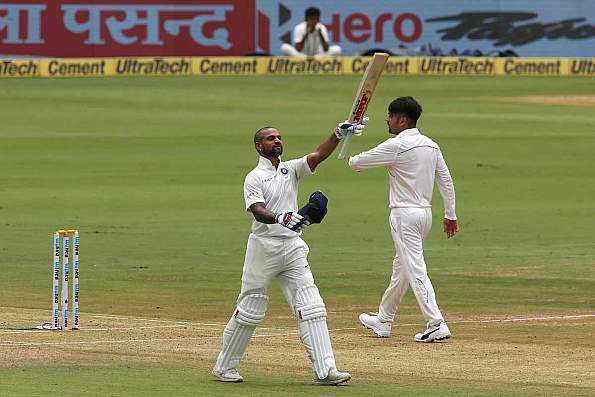 While Murali Vijay and KL Rahul made important contributions, it was Shikhar Dhawan's record of becoming the first Indian to score a hundred before Lunch on Day 1 in a Test that stole the show. Dhawan's early battles with Afghanistan's premier bowler Rashid Khan was one in which there was only one winner. Dhawan hit him for eight fours and a six in his 107 and later credited his IPL experience for coming out on top in the battle. "The good thing is that I had faced him [Rashid Khan] in nets for two years because we play for the same team in IPL. So, I was used to his bowling and that helped me," said Dhawan at the end of the day. While Rashid turned his day around with a better final spell of 9-2-15-1, Dhawan did not feel that the other batsmen could have changed their approach against him to be successful. "See each one will have a different game," he said. "A team is formed of different characters - I am a different character, my game is different to what Vijay's is. Each player has his own qualities. Some people like to step out and play and some others don't prefer that. Each individual has his own game and plays accordingly. My strength is to step out and play and I play accordingly." The opener acknowledged the fight shown by Afghanistan after his knock, and Rashid. "Yeah, they came back very well in the last session. They are playing their first game, I am sure they are going to learn a lot of things. They are going to go a long way," he said and quipped, "Of course, Rashid is a top-class bowler and I enjoyed my battles with him. Since I dominated [this one] I enjoyed it but as I said, he is a great bowler."